I'm going to dedicate this post entirely to a recent case presented by my wonderful colleague Bobbi Pritt (Mayo Clinic) in collaboration with Blaine Mathison (CDC), whom I have also been so fortunate to meet. Please go here to see the case. Creepy Dreadful Wonderful Parasites: Case of the Week 390. Let me use the opportunity to congratulate Bobbi Pritt on her fantastic work, admirable skills, and dedication to parasitology! And by the way; why not treat yourself to Bobbi's 2016 parasite calendar available for purchase here. Few commercial kits are available for detection of Blastocystis. One of them is the ParaFlorB kit developed by Boulder Diagnostics which uses a monoclonal antibody to detect Blastocystis-specific antigen. We are currently testing this kit in our lab, and I hope to be able to get back with a summary of our experience once the evaluation has finished. Another kit is the EasyScreenTM Enteric Parasite Detection Kit (Genetic Signatures, Sydney, Australia), which was recently evaluated by some of my Australian colleagues (Stark et al., 2013). In this case, Blastocystis has been included in a panel testing for 5 parasitic genera, the other ones being Giardia, Cryptosporidium, Entamoeba, and Dientamoeba, which makes it interesting in a clinical microbiology context, - at least for research purposes. It can certainly be discussed whether both Dientamoeba and Blastocystis should be part of routine screening for single-celled intestinal parasites. For some years, we have included Dientamoeba in a PCR panel also consisting of Cryptosporidium, Giardia and Entamoeba, but we are about to remove it from this panel. This does not mean that we will not be testing for Dientamoeba; it only means that we will offer testing for Dientamoeba as a separate analysis, in line with our tests for Blastocystis. According to the study, the kit performs quite well with the only major impediment being the fact that it does not enable differentiation between pathogenic and apathogenic species of Entamoeba; another drawback is the fact that it does not enable detection of the more rare protozoa, such as Cystoisospora and Cyclospora (and I would also mention microsporidia and maybe Balantidium coli). Also, I might be a little worried that the kit will not pick up all species and genotypes of Cryptosporidium, - in fact little was done to challenge the kit in the evaluation. Regarding Cryptosporidium, only C. hominis and C. parvum were tested. In Sweden, at least 10% of all human cryptosporidiosis is due to non-hominis and non-parvum species and genotypes. This is an observation that has led me to revisit our own Cryptosporidium real-time PCR. With help from Welsh and Swedish colleagues I managed to establish quite a broad panel of different Cryptosporidium species and genotypes, and much to my surprise, our 'old' real-time PCR failed to detect the vast majority of these... which means that this Cryptosporidium PCR was far from genus-specific. So, I set out to design a genus-specific PCR which is now being integrated with our Giardia real-time PCR in a duplex assay. Anyway, similar to Cryptosporidium, many species of Blastocystis - the so-called subtypes - can colonise and infect humans. In the evaluation of the EasyScreen kit, only subtypes 1, 3, and 4 were used to challenge the kit, and so, it is not known whether the kit also detects other subtypes found in humans (ST2, ST5, ST6, ST7, ST8, and ST9). For those interested in these diagnostic multiplex systems, please also visit a previous blog post. Anastasios Tsaousis and his Canadian group in Halifax had a paper out just now in Eukaryotic Cell expanding their work on the evolution of the cytosolic iron/sulfur cluster assembly machinery in Blastocystis spp. and other microbial eukaryotes. This type of work is crucial for obtaining a deeper understanding of the metabolism of Blastocystis and to understand how it has evolved and how it potentially differs from other eukaryotes. Apparently, Iron-sulfur cluster-containing proteins and their biosynthetic machinery in single-celled parasites are remarkably different from those in their mammalian hosts and they therefore represent a potentially relevant target for the development of novel chemotherapeutic and prophylactic agents against parasite infections. For those interested in iron-sulfur clusters in protists in general, a review was published in Advances in Parasitology some weeks ago (please see cited literature). There is paper out on fasciolosis and co-infections, including Blastocystis, and in that paper it appears that nitazoxanide may be able to eradicate Blastocystis. 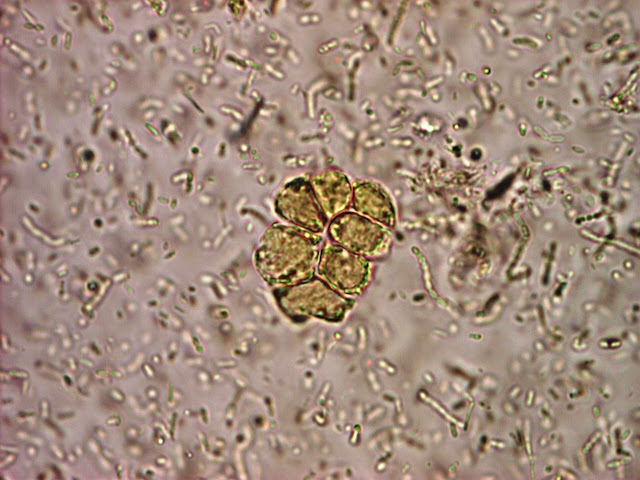 However, only three persons were treated, and I'm not sure that the diagnostic tests used would have picked up light infections of Blastocystis. Speaking of treatment: Another paper has appeared from the highly productive team in Sydney, - this time on treatment failure in patients with chronic Blastocystis infection and first-authored by Ms Tamalee Roberts, whom I was so fortunate to spend some time with during the recent congress in Copenhagen. The paper is a little difficult to follow, particularly since nothing is mentioned in the Materials and Methods section on the choice of treatment and treatment strategies in general, but then again, the paper is based on a string of individual (groups of) cases with different kinds of treatment approaches and various backgrounds. I really like the fact that the authors are looking at multiple cases and also that have included a few patients receiving the Triple Therapy (nitazoxanide, furazolidone, secnidazole), which appears to have no major clinical efficacy. The paper also confirms the uselessness of metronidazole when it comes to eradicating Blastocystis. What I could have wished for is that the authors had been able to pursue the microbiological effect of treatment in each of the cases; only in some cases do we get to know about clearance/persistence of Blastocystis. Also, here at the SSI we sometimes wonder, whether persistence of symptoms after treatment may in some cases reflect adverse effects of the treatment (including perturbation of intestinal flora), in which case even randomised controlled treatment (RCT) studies are difficult to design and interpret, unless very clear case definitions and inclusion criteria are available. Hence, for RCT studies I think it is pertinent only to include patients with very similar symptoms (and possibly microbiomes! ); given the prevalence of Blastocystis, this shouldn't be too difficult. Regarding my most recent blog post, I have noticed that it caused quite a stir! I did anticipate some kerfuffle though. But fact is that we have gradually been able to collect so much data from different, independent studies, and the trend appears clear. We now need to investigate what this means, and whether this is something that can be exploited. There will be no DEC 2013 version of 'This Month in Blastocystis Research' - instead I plan on doing a 'Blastocystis Highlights in 2013' post in line with last year's. Suggestions for significant papers/contributions are welcome!